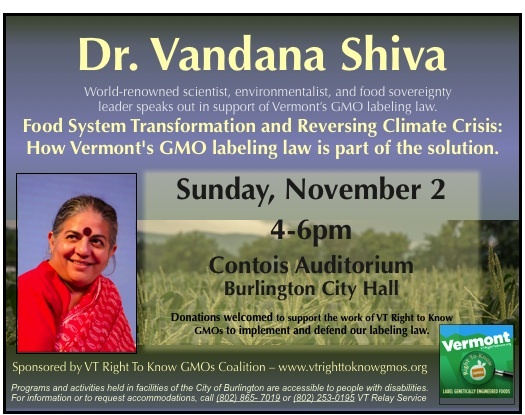 We are thrilled to be welcoming Dr. Vandana Shiva to Vermont for two speaking engagements next week in support of VT's GMO labeling law. Her presentation is titled: Food System Transformation and Reversing the Climate Crisis: How Vermont’s GMO labeling law is part of the solution. Dr. Shiva will speak on Sunday, November 2, 2014, 4:00-6:00PM at the Contois Auditorium in Burlington’s City Hall, 149 Church Street. This event will be livestreamed at this link beginning at 3:55. Dr. Shiva will also speak at the Vermont Law School on Monday Nov. 3 at 5:00PM in the Chase Center. This event is sponsored by the VLS Center for Agriculture and Food Systems. Both events are open to the public, and donations will be welcomed to support the ongoing work of the Vermont Right to Know GMOs Coalition to implement and defend Vermont’s GMO food labeling law. Dr. Shiva’s visit to Vermont is being facilitated and co-sponsored by the Vermont Right to Know GMOs Coalition which is a partnership of Cedar Circle Farm & Education Center, NOFA-VT, Rural Vermont and VPIRG.